This trip was planned because we had paddled the Upper Pine last month, and noticed a bit of trash along the way. It was time to get rid of it! I originally scheduled it for Saturday, but with a forecast of 100% chance of thunderstorms, I moved it back one day. Unfortunately, I lost half the group (mostly due to work conflicts), but gained some new folks after contacting some active paddlers who had done Pine cleanup trips in the past. 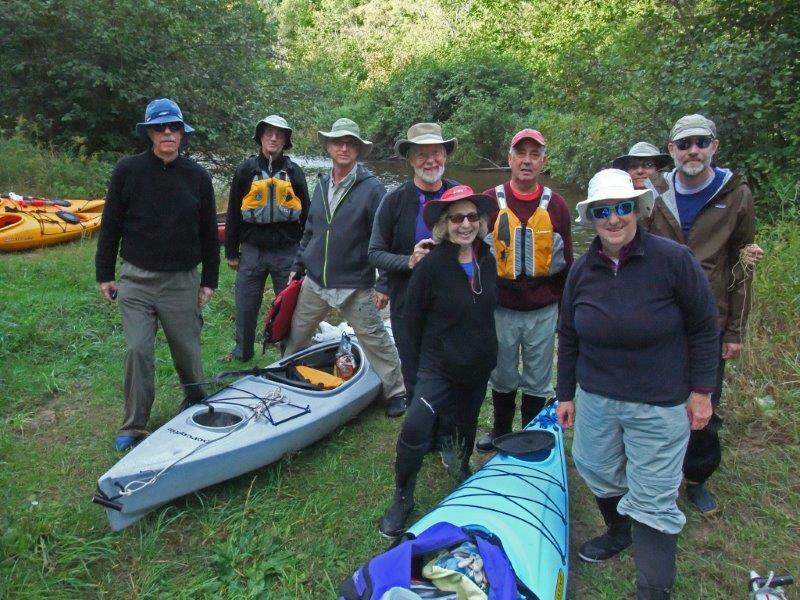 The eventual roster included me (Lois), Glenn, Debby & Mike, Fred & Judy, Dan (the membership man), Henry and his buddy and paddler extraordinaire, Arunas. We were given royal shuttle treatment by Mark Miltner himself, the owner of Pine River Paddlesports Center. He met us at Walker Bridge, loaded all our boats onto a trailer and then put us and our stuff inside to drive us to the river access at Briarpatch. We encountered the numerous rock gardens in the first couple of hours, with one unplanned tumble into the water. It was nice and sunny, and his clothes dried by the time we finished our leisurely lunch stop at Skookum. There hadn't been much rain in the previous few days, so the water was very clear, and it was easy to spot the very small amount of trash. We found three large bags the usual stuff, though Fred remarked that he was disappointed that he had found only three of the four main trash groups: beer cans, water bottles and plastic bags, but that he had not yet located any flip-flops. We did make up for that deficit with Debby hauling in a giant piece of Styrofoam in her kayak. After lunch, Arunas didn't believe Debby when she mentioned that he shouldn't try to follow Mike as he meandered through some tiny slots and around downed trees. Arunas realized that he should have listened to her! He remained calm when he landed sideways on a tree trunk, and was grateful for our verbal assistance in extricating himself from the dicey situation, and eventually floated through the next slot in control in a backwards configuration. 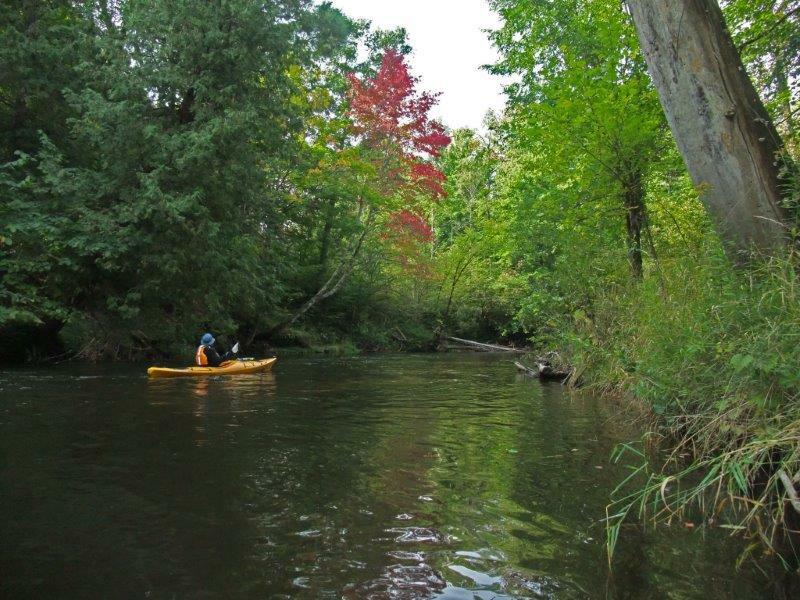 Four of the people had never paddled the Upper Pine before, and they all declared it to be one of the loveliest streams they had ever seen. It was a wonderful day, summed up by Glenn, who declared the Upper Pine as "an insanely incredible river"! 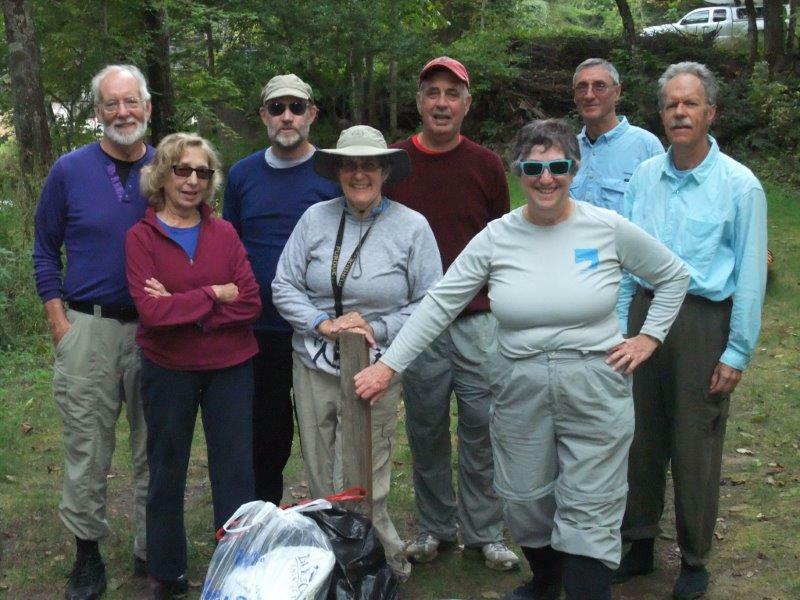 Photos by Lois and Glenn - who took this one of us at the end - so much better than mine - you can't see our third bag of trash, but we all look happy - and in focus!